My last post highlighted Paul Krugman’s accusation that the top 1% richest people support bad monetary policy because they have more to gain from low inflation than the bottom 99%. But I don’t think that bad monetary policy really helps the richest 1%. I think everyone including the rich would benefit from better monetary policy because it would bring more GDP growth and it is almost impossible to have GDP growth without growth in the incomes of the richest 1% too. They claim so darn much of GDP that a rising tide of GDP almost always raises all their yachts even though growing GDP doesn’t always raise the little boats. For example, according to Piketty and Saez’s data, the only year in US history since 1917 when GDP rose, but income for the elites declined was in 1941 when all the economic growth went to the bottom 90% and the income for the richest 10% dropped ever so slightly! But it was a brief anomaly and the incomes of the richest 10% immediately rebounded the next year and continued growing robustly along with GDP ever since. The early 1940s was the “great compression” when inequality dropped and the golden age of the American middle class began. 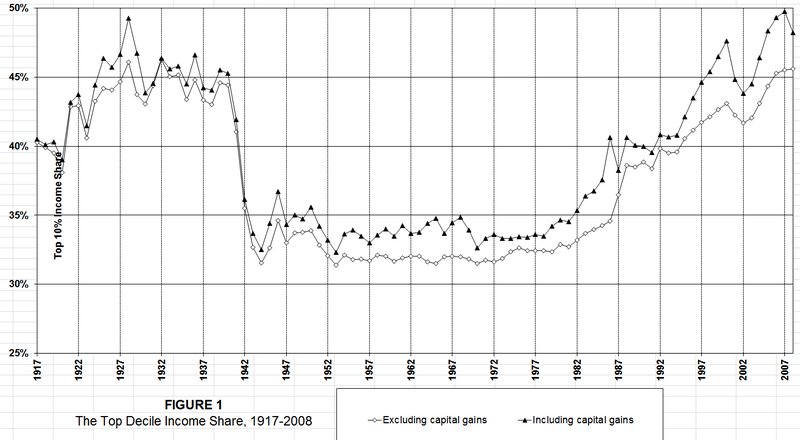 A graph of the decline in their income share is dramatic, but because total income was growing rapidly, their actual income didn’t change much. You can also play with this data using an interactive graphic at the State of Working America. So even though better monetary policy is likely to decrease inequality, the rich have nothing to fear except fear itself. the sad truth is that virtually no one believes that high inflation helps economic growth when the economy is weak. I believe it. Krugman believes it. DeLong believes it. But among those who don’t follow the minutiae of economic research—i.e., nearly everyone—it sounds crazy. That goes for the top 0.1 percent as well as it does for everyone else. If they truly believed that higher inflation would get the economy roaring again, they might support it. (Might!) But they don’t…. It’s worth noting that hard money convictions are the norm virtually everywhere in the developed world, even in places that are a lot more egalitarian than the United States. Inflationary fears may be irrational, especially under our current economic conditions, but ancient fears are hard to deal with. As it happens, the erosion of assets during the 70s was unique to the conditions of the 70s, which included a lot more than just a few years of high inflation. But inflation is what people remember, so inflation is still what they fear.Bottom line: Even among non-hysterics, I’d say that hardly anyone really, truly believes in their hearts that high inflation would be good for economic growth. It’s the kind of thing that you have to convince yourself of by sheer mental effort, and even at that you’re probably still a little wobbly about the whole idea. It just seems so crazy. Until that changes, fear of inflation isn’t going anywhere. The problem is more a problem of the power of ideas rather than the power of vested interests. Until we economists can convince our rulers that higher inflation IS better monetary policy, nothing is going to change. There are people at the Fed who realize that higher inflation would be better, but they are too timid to buck the popular will and the American selectorate’s conventional ‘wisdom’ prevents monetary policy radicals (like myself) from ever getting near the hallowed halls of the Fed to create more inflation. ‹ Who wins when monetary policy prioritizes low inflation over wage growth or unemployment?